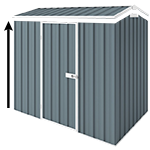 Spacesaver range of garden sheds is the ultimate storage unit for those areas where space is limited. Easily fits under eaves and is large enough to store tools, sporting equipment etc. Ideal for storage in garages & carports in unit complexes. I was shopping for a space-saver shed by size. This one came up & was clearly the winner: the price, colour options & look were second to none. Delivery was quick, the staff were very helpful & the instructional videos made assembly really easy. Would definately buy another product ftom "Cheap sheds". Review by Tom W.A. Was a great quality shed for the price, recommended to the other landlords in the complex who also bought the exact same ones. They were ecstatic with their purchase as well.